Donkeylicious: Who Will Challenge Chuck Grassley? Back when Janet Napolitano and Kathleen Sebelius joined the Obama Cabinet, there was a lot of unhappiness about how it would deprive us of two excellent Senate challengers in 2010. The unhappy people were, certainly, right to be displeased. I don't remember anybody saying the same thing about Tom Vilsack, but I'm starting to wonder if we should've felt the same way about his appointment to Agriculture too. I have no idea if he could've been talked into running, but he's a two-term ex-governor in a state where we lack any major Senate challenger for Chuck Grassley. 538 tells us that the seat is the 20th most likely to change hands. With no serious general-election challenger, all Grassley has to worry about is a primary challenge if he doesn't stick tightly enough to right-wing MUSTSTOP dogma. There's nobody to call him out on being an obstacle to reform, or pressure him to do anything constructive. I'm taken aback that we can't find anybody else to jump into the race in Iowa. I mean, the state is full of good Democrats -- we've got a 32-18 majority in the state Senate, an attorney general coming off his 4th consecutive term, and a Lieutenant Governor. Sure, Grassley is a powerful incumbent, but a lot of GOP incumbents have gone down over the last couple cycles. Obama has always been popular in the state. You'd think people would be jumping in. He doesn't even have the courtesy to spell Speaker Pelosi's name correctly in his Twitter post. How unprofessional can you get? The median college student would make a better senator. I'm originally from Iowa. Everyone likes Chuck because he actually grew up in Iowa, working manufacturing jobs. He's on the Finance committee, and is pretty good at porkbarreling for Iowa. He's been in politics forever, and I think the well-aged people who vote for him find that comforting. "Grassley may be the single biggest Republican obstacle to health care progress in all of Congress, simply because of his close relationship with Senate Finance chairman Max Baucus, which translates into an ability to freeze Baucus into inactivity." There are two possible explanations here that are considerably more likely than that Grassley has Baucus hypnotized. 2) Obama (stupidly) wants Republican votes on healthcare, so Baucus is just doing what he's been instructed to do. 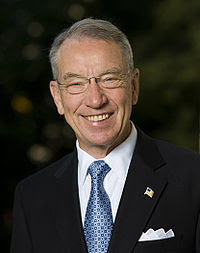 Either way, it's Baucus giving Grassley a veto over the Senate legislation. And if Grassley weren't in that situation, some other "moderate" Republican would be. Baucus, for reason either 1) or 2) is the one held hostage to getting GOP support, and whether or not Grassley sits in the Senate, that equation wouldn't change. I agree that Baucus is giving Grassley a veto over this stuff, and that's bad. The thing is, if we put enough pressure on Grassley and had a serious opponent calling him out on his inaction, Grassley might be more inclined to let things more forward. It's not super likely, but it's more likely than Grassley letting stuff move forward of his own accord. "The thing is, if we put enough pressure on Grassley and had a serious opponent calling him out on his inaction, Grassley might be more inclined to let things more forward." If the WH had their strategy well thought out, and had been co-ordinating with Baucus, then unveiling a strong '10 Iowa candidate in August would be perfect. I was impressed how the unveilling of a '10 challenger for DeMint was timed so closely after the introduction of DeMint as the enemy of sensible reform. That's how the game should be played. Guessing what's going on with Max right now is dealing with a black box. He just smiles for the camera and has a perfect poker face. Max Baucus is the personification of Lady Gaga. Wait, do we have a '10 challenger for DeMint? I didn't see that. I gave some money to Matt Singer's Forward Montana people, just because it's the closest thing I have to a way to affect Baucus. Apparently they have some kind of relationship with his health care staffers. "Wait, do we have a '10 challenger for DeMint? I didn't see that." Well, the DSCC was floating this earlier this week. And the DNC went up with anti-DeMint ads in SC this week. It was all excellent politics in the wake of demonizing DeMint's comments. The lack of pressure in Iowa (or Montana) indicates to me that the whole Baucus charade is part of the WH's planning, which seems bad card playing to me. I don't want no stinking GOP votes on this bill. I'd rather have the Party own this issue. But it's hard to be sure of what's really going on. There's a long-time state pol named Bob Krause that's tossed his hat in the ring. So far, not much national support, but he seems like he could be a contender. If the party throws its weight ($$) behind him. It was with regret but no surprise that I learned this afternoon of Senator Charles Grassley's announcement that he will vote against the nomination of Judge Sonia Sotomayor to fill the Supreme Court vacancy created by the retirement of Justice David Souter. Senator Grassley's vote against Judge Sotomayor is the capstone to a long string of anti-women votes by Iowa's senior senator. In combined 2007-2008 alone, he was rated at 40% favorable by the American Association of University Women (AAUW). This is actually his best in years. He was at 33% with AAUW in 2007 and just 10% in 2005-2006, just after his successful re-election. Perhaps next year, which is an election year, his women's vote rating will improve. But I am not hopeful of that improvement. On the first significant civil rights bill of 2009, Grassley voted against closing a huge loophole in the equal pay for equal work statute. Had Grassley prevailed it would have remained very easy for large corporations to discriminate on pay to women and get away with it. Thus, it is not surprising that Senator Grassley's first vote against a Supreme Court nominee in 29 years is against a woman. Her confirmation is important not only to women and Hispanics, but to all Americans as a reaffirmation of the great melting pot of humanity that is the United States. It is unfortunate that Senator Grassley has chosen to again follow the party line and put partisanship above the interests of Iowans. I urge Senator Grassley to change his mind and vote "yes" to confirm a well qualified nominee for the highest court in the land.